What is the correlation between credit scores and mortgage rates? If it's low, do anything you can to make it better! Does a low credit score really cause my mortgage rate to increase? And by how much? The data is pulled by myFICO, a division of the Fair Isaac Corporation, with interest rates as of November 13, 2012. As you can see, a good credit score can definitely work in your favor. 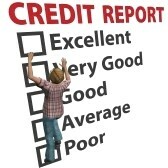 Raising your credit score is a trick and there is a way to do it most effectively and quickly. I can help with guidance and suggestions on how to do it.